How Do I Know Which Type of Epoxy Flooring Is Best For My Floor? This is a question many customers ask us along with why is your epoxy better and what does it cost. The following information will answer those questions and help you make the right purchase for your particular floor application. There are different types of flooring you can use in addition to an epoxy coating such as Interlocking Tiles or Rubber Garage Floor Mats. There's a good discussion here Epoxy vs Tile vs Mats about the pros and cons of each of these different products you can use. But if you've set your heart on a super high gloss epoxy floor coating then stay on this page and we'll tell you everything you need to know. From being one of the largest epoxy installers in the Tri State area we've learned over the years exactly what works and what doesn't. There's so many choices today it can be down right confusing and frustrating not to mention easy to make a mistake. The problem is that a lot of the products you'll see don't live up to their marketing in real life. They'll state they are heavy duty, commercial or industrial grade floor coatings and will last a lifetime when they're no such thing nor capable of any such thing. Know the facts before you buy! If you think you can get a floor that looks like the beautiful red floor above by just going down to your local store or ordering some epoxy online without knowing what you're buying, you couldn't be more wrong! The best way to avoid buying the wrong epoxy flooring is to know the basic facts and learn what causes epoxy coatings to fail or look like they failed. Reading and learning to understand the specifications of each epoxy you're considering is an important factor. The specifications don't lie and they tell you exactly what the coating is or isn't capable of. It's actually very simple once you know what to look for! There's a lot to read here but it's well worth your time, it will clear up a lot of the confusion and years from now when your floor still looks new you'll be glad you did. The cost of applying a high quality multi layer epoxy floor coating system as compared to off the shelf water based or hybrid one coat type epoxies can be relatively much more expensive. 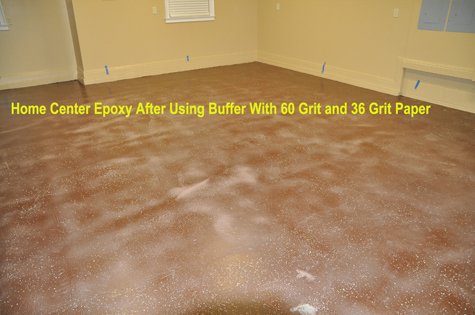 So do you need a quality epoxy coating or is a cheap epoxy paint good enough for your floor? What type of look and finish do you want. Solid color, clear finish or colored flake finish? What level of durability do you want and or need. Is your floor an industrial application or residential application or somewhere in between? And how do you know an epoxy is really industrial or commercial grade? Many epoxies call themselves industrial or commercial grade until they're on your floor and you wear right through them. At that point the damage is done, this page will hopefully help you avoid being in that situation. What condition is your concrete floor in? Is it new, is it old, is it pitted, is it oil stained, does it have a moisture issue? Your floor may need special attention to avoid a failure down the road. These are some of the questions we will answer in the discussion below. Not addressing these questions prior to your purchase is a more likely than not going to lead to disappointing results. The first thing you need to determine is what kind of finish you want/need and what your budget is. Whether your coating an industrial floor or just your garage floor or something in between. If your budget won't allow you to use an epoxy coating system that is equal to or greater than the traffic loads you will run on the floor, then our best advice is don't epoxy paint your floor. You're better off going to your local home improvement store and purchasing a sealer and simply sealing the slab to protect against corrosion and to make it easier to clean. $1.00 - $1.75 per square foot depending on size and type of floor and the type of epoxy system used. Compared to an average price of $4.00 - $8.00 per sf to have a company come in and do it for you. By the way all costs for epoxy flooring should be based on a per square foot basis. Anybody quoting you prices based on any other parameter is just selling you marketing hype. You can do an epoxy floor cheaper with lower quality water based and one coat epoxies but they either peel off your floor and or wear out very quickly. So they're a cheaper first cost option but then you'll most likely have to diamond grind the floor clean to redo your floor properly in the near future. Thus causing you to spend lots of extra time, angst and money at the end of the day. With epoxy floor coatings you absolutely get what you pay for! Let's discuss types of epoxies. It's best you avoid any type of water based epoxy. They're just not good, especially the ones you can buy in the big box stores. Next are Cyclioaliphatic epoxies, they will save you money since they are a hybrid type of epoxy and don't come with a true topcoat. They are not as hard as aliphatic epoxies with a urethane topcoat and not nearly as thick. This makes them prone to dulling, fading, yellowing and just simply wearing out. Some offer a clear version of the epoxy with some additives to resist fading and yellowing. This unfortunately does not change anything, your floor will still yellow wear out and lose it's gloss finish quickly. The clear version of the epoxy applied over the colored epoxy still has the same poor abrasion loss rating. You need an abrasion rating of 20mgs or lower for residential floor, 8mgs or lower for commercial flooring and 4mgs or lower for an industrial flooring application. Using an epoxy floor paint with high abrasion loss ratings over 20mgs or even worse using an epoxy with no abrasion loss rating is a sure recipe for disaster. Not heeding these guide lines is a guaranteed way to end up with an epoxy floor that dulls and wears out very quickly. It's abrasion from any form of traffic on the floor that will first cause your coating to lose its gloss finish and then start to wear right through the coating down to the bare concrete. In no time at all your floor starts to look like it did before you epoxy painted it or worse. If your budget is tight stick with a sealer or an oil based concrete enamel that you can reapply every year. That alone was worth the time reading this page cause it will save you a lot of time, money and aggravation in the future. Don't use a low quality epoxy, it's the worst thing you can do to a floor. We can't emphasize this enough. Once you've made your decision to go with quality epoxy floor coating you next need to determine if you want a color flake finish and if so do you want a light flake finish or heavy flake finish? Or do you want a solid color epoxy floor finish? In general most garages floors use an epoxy finish with color flakes, most floors that have work being done on them with small parts or screws that can fall on the floor do not use the color flakes since it makes finding these small items on the floor a little harder. At the end of the day this is a question only you can answer as to which looks better to you and or which will work better for you. Once you've determined the look you want then you need to determine what level of durability you want and or need. There are dozens of epoxy companies selling a single product to meet the needs of every customer and every type of floor. We think that's not only the wrong approach it's just not possible. That's why we offer so many different floor epoxy systems, it may be a little confusing but it's the only way to get the best possible results when dealing with epoxy paints and coatings. So let's talk quickly about the two most important aspects of epoxy floor coatings and why you use them instead of enamel paint. The first reason is adhesion, epoxy coatings have a much higher adhesion capability than enamel unless it's a water based epoxy which are worse than enamels. We won't get into the why but just know that water based epoxies are just not good at sticking to your floor. Next is the durability, Aliphatic epoxies combined with a urethane epoxy topcoat are the highest quality epoxy systems you can put on your floor, period. Again compare the abrasion ratings and remember the lower the rating the better. One other thing about abrasion ratings, they are exponential so a small difference in the ratings means a huge difference in durability. We have four levels of durability: industrial floor grade which is a 4mg abrasion loss rating, commercial floor grade which is an 8mg abrasion loss rating and a residential floor grade which is 20mg abrasion loss rating. First let us say that our residential grade is more durable than almost all other so called industrial grade epoxies and we'll explain why as we go along. What is abrasion loss? It is what happens to your floor coating every time you walk on it or drive a vehicle on it with twisting turning tires. It's that abrasion that wears your floor out and makes it dull, dirty and unsightly. So you want an epoxy coating that is the thickest to start out with and has the lowest abrasion rating possible. How do you know which is the best? Our industry has what is called a Taber CS-17 abrasion test, all the manufacturers use that test to determine their coating's ability to resist everyday wear and tear. It's a simple abrasion wheel that has a standard weight on it and spun for an X amount of cycles, usually 500. Then the amount of material that was ground off is weighed. The lower the amount of mgs that came off the better, meaning a coating with a lower mg loss rate can resist tire abrasion much better than a coating with a higher loss rating. How can you find out the abrasion rating of an epoxy coating? Look at the Spec sheet for that product it should list the adhesion rating and the abrasion rating. If any one of those ratings are missing steer clear of that product. We've put together a chart where you can compare these ratings between some of the more popular brands. See our EPOXY COATING CHART to compare the performance of an epoxy you may be considering. So beware of any coating with high abrasion loss ratings and any coating that tries to sell you a clear version of their epoxy as a topcoat. Epoxies are not topcoats and cannot be made into topcoats with additives. This is a pure and simple gimmick. You'll also notice that a lot of companies don't even publish an abrasion loss rating. This is a sure sign to steer clear of those products. Another warning sign is any epoxy that has an induction time or a pot life longer than 1 hr is your cue to stay away. The rule is the longer the pot life the lower the quality the epoxy is. BELOW ARE SOME GUIDELINES TO HELP YOU SELECT THE BEST EPOXY FOR YOU. Lets start out with the residential epoxy systems, if you have a garage floor you want to coat and all you do is roll your passenger cars in and out each day then all you need is our standard Armor Chip or Armor Granite kits. These are complete kits with everything you need and come with our military grade high build 100% solids aliphatic epoxy. Armor Chip Floor Epoxy comes with 8 lbs of multi color flakes that you toss into the epoxy and two layers of our 20mg clear topcoat to seal in the chips and protect the floor epoxy from abrasion wear. Armor Chip will cover up to 550 SF. Armor Granite epoxy flooring is similar but comes with 20lbs of flakes, spiked soles and three layers of clear topcoat. Armor Granite will cover up to 500 SF. We sell half kits for both to fit just about any floor size. If you want the color flake look but want or need more durability. We offer a military upgrade option for the topcoat to get you down to a 4mg loss rating, this is many orders of magnitude better than any other topcoat out there. Many customers choose this option whether they need it or not, they simply want the most durable finish they can get. If you're doing a commercial floor such as a shop floor, hangar or warehouse with medium to light forklift and pallet jack traffic then use our Armor II Commercial Epoxy Floor Coating. This system does not use color flakes. It has a color base coat followed by a color topcoat with an 8mg abrasion loss rating. This will handle most floor applications and if you want a solid color look for your garage floor, Armor II works great in garage floors. With Armor II you'll have a garage floor finish that is very durable and will look like a solid sheet of porcelain when you're done. Armor II is sold in different size kits starting with a kit that does up to 600 SF. Next is our Military/Industrial Floor Epoxy System . This is for floors where cost is not the major factor and strength and durability are. Our ultra package can handle the toughest traffic and consists of a high performance primer, high build military grade epoxy and the 4mg military grade clear topcoat. Primer and epoxy are usually the same color and because we finish with a topcoat you can use color flakes in this floor. This floor can handle heavy forklift and pallet jack traffic and just about anything else. Once you determined which flooring epoxy system best meets your needs just click on one of the blue links above to go to that product page. If you've never used epoxy coatings before we strongly suggest you read the information contained in the links under Related Items at the bottom of this page. They will make sure you avoid the mistakes most people make when epoxy coating their floors so that you won't have to do your floor twice. Next to selecting a high quality floor epoxy coating that is equal to the traffic load it will see, proper floor preparation is the key to having that epoxy coating permanently bonded to your floor. So the final step in the process is to determine what type of floor you have. Is it a new floor, old floor, oil stained floor, a floor with moisture or a previously painted floor. These are all factors that will determine how exactly you need to prep your floor. So click on each of the Tabs above for additional information on the final step prior to purchasing and applying the epoxy to your floor. If there are any questions you have about selecting the right product, applying it or floor prep we are always here to help. Just send us an email or give us a call. Below is one floor type example, see the Must Read Tab for more floor type examples. Also right up there with the type of epoxy you choose and the cost of that epoxy floor system is the floor preparation. We strongly recommend you read our How To Prep And Epoxy Paint Your Floor Page, see the link at the bottom of this page. Previously Painted Floors: This is a very common situation where a floor has been coated previously with a retail grade floor paint or low quality floor epoxy. These types of coatings fail to a varying degree. The goal here is to determine if the existing coating can be a suitable foundation for your new epoxy floor. You do not want to go through the time and expense of applying a new epoxy floor coating only to have it come off with the defective paint under it. There are two situations you can wind up with. Either a coating that is not properly bonded to the concrete and must be fully removed or a coating that is only partially failing. First test the coating with a good floor scraper, if you are able to get the coating to come off the floor by scraping then you must remove all of it. If scraping only removes a very small portion of it then sand the floor with a floor sander or floor buffing machine using at least a 30 grit pad, if most of the coating is coming off at this point you must make sure to remove it entirely. If only a small portion of the coating has failed then repeat with a 60 grit pad. Power wash off residue. Then use a strong Etching solution to etch the floor coating and any bare concrete, we recommend one of our Acid Etching kits per 400-500 sq ft. This will expose any weakly bonded floor coating by scraping the old coating with a good floor scraper this will cause any of the weakly bonded paint to come off. If most of the old coating removes easily then make sure to remove all of it. This floor coating is not properly bonded to the concrete and is not a suitable foundation for a new floor epoxy coating. Use an Industrial floor scrapper to make the job easier, we have one available in our crack & joint repair section if needed. If your coating has survived up to this point you can coat it with our Bonding Primer, this will act as a bonding agent between the old coating and the new floor epoxy. Not using a bonding primer is rolling the dice on whether the new epoxy will properly bond to the old coating. Here is a set of great images taken by one of our customers when he applied Armor Chip to the previous Home Owner's Home Improvement Center epoxy.. When to use the different types of our epoxy floor coating systems. This by no means covers everything but does cover a wide variety of epoxy flooring applications. For applications not listed here you can read between the lines for applications that are similar and for those that are please give us a call to discuss. EDUCATION: Schools and Colleges have many areas that can benefit from and epoxy floor coating. Floors in the classrooms and hallways get high traffic and abrasion from desks and chairs. These areas are a good candidate for the military industrial floor epoxy system. It provides and extra thick coating and an extra hard clear topcoat that can be reapplied at any time when needed. This will bring the floor back to looking brand new since the epoxy underneath should remain untouched. Locker rooms and kitchen areas: are another common application for floor epoxy. Since most of these floors are usually cover with tiles they are difficult to coat over. We have a proprietary primer that will bond to ceramic, porcelain and quarry tiles that allow us to coat over them with our epoxy floor coatings. Locker rooms can use the commercial floor epoxy system while we always recommend kitchens be done with the Industrial flooring epoxy system. If downtime is critical such as in the kitchen or hallways you can use our Ultra Fast Drying Industrial floor epoxy coating. It has an incredible adhesion rating of 725 psi, no other coating comes even close and has an incredible hard finish with an abrasion loss rating of only 3 mgs. No other coating comes close to that either. Most floor epoxies have abrasion loss ratings of 25 mgs and higher making them not suitable for high traffic areas. With Ultra Fast you can prep and coat your floor and be back in full service the same day. SHOPS: Lets start with a workshop located in your home such as in the garage. We recommend the Armor II commercial floor epoxy system. It works whether you are working on autos or wood. It can handle floor jacks, large rolling tool chests, dollies and is very impact resistant. You can also use the garage epoxy floor kit with the military grade topcoat but we just want you to keep in mind that the colored flakes make it sometimes difficult to find small screws and parts that get dropped on the floor. If your wood shop is located in your basement or other area in your house, we strongly recommend you go with the garage epoxy floor kit with the indoor topcoat to avoid the strong fumes associated with the commercial system and the industrial clear topcoat. The commercial and industrial epoxy floor systems require urethane topcoats to give them the proper hardness but have a strong odor while curing that is not suitable for in house use. Race Shops: can use the Industrial Flooring Epoxy System if they are a professional race team with high traffic and lots of work being done in the shop. If you have a recreational race shop you can use the commercial package or the garage epoxy kit. If you use the garage kit we would recommend you upgrade the clear topcoat to the military grade one. The military grade topcoat has a much harder finish due to tighter cross linking of the molecules. What that means is that your floor can take much more abuse without losing its high gloss finish. Many epoxy systems stay stuck to your floor but look like who did it and ran in a lot shorter period of time then you would expect. That�s why it�s critical to have the hardest urethane topcoat finish you can get. Machine Shops: can use the Ultra Fast flooring epoxy if down time is an issue, they can use the industrial epoxy system if they are a heavy industry type shop or in the case of a CNC shop you can use the commercial epoxy system. All of the above will handle any amount of wheel or foot traffic including forklifts. If you have high forklift traffic we recommend you stick with the Ultra Fast epoxy or the industrial epoxy system. Maintenance shops: use the commercial epoxy system unless it�s a heavy industry shop with lost of forklift traffic and heavy equipment being moved around, In that case use the industrial epoxy system. INSTITUTIONAL: Correctional facilities very often use high quality epoxy coatings in the cells and kitchen areas. Inmates are notorious for ripping, scraping and breaking anything and everything they can. So correctional facilities must have the toughest coating possible. They also have limited time as to when they can refurbish the cells or kitchen floors. This why Ultra Fast floor epoxy is the best product for these types of applications. Hard as nails finish, waterproof and minimum down time. Nursing Homes and assisted living facilities: can use the commercial epoxy system in any area where they want or need an easy to clean floor with a nice appearance. In the commercial kitchen area it�s the industrial epoxy system that�s needed with the extra strength nonslip additive. Laundry rooms and loading docks: can also use the commercial epoxy system. AUTOMOTIVE: Dealerships: have many uses for an epoxy floor finish. The most common is in the repair shop. For high volume dealers it�s the industrial epoxy system with the extra coarse nonslip additive in the topcoat. For low volume dealerships or private repair shops use the commercial poy system. Oil change, brake and muffler shops can also use the commercial system. They can also use the industrial system if desired or the Ultra Fast floor epoxy if downtime is a concern. The biggest issue with automotive applications is the floor preparation. Floors are usually extremely dirty and oil stained due to not ever having anything protecting the floor. If the floor is extremely dirty do not try to clean with the acid etching method, it will not be sufficient. We recommend you grind the floor to get down to clean concrete. If the floor has oil stains treat them by scrubbing in some Liquid Tide with muriatic acid. Once the stain is removed scrub in some TSP powder to neutralize the acid. If the majority of your floor is cover with oil stains, then we recommend you apply our oil stain primer. It is a proprietary primer that has the ability to bond to oil. Trying to paint over an oil soaked floor without our primer is a guarantee that your floor epoxy will be peeling up off in short order. All of our flooring epoxy systems are impervious to any and all vehicle fluids and cleaning agents. We do however recommend that you do not leave brake or carb cleaner on the floor for more than 48 hrs. If left uncleaned for longer than that these harsh solvents can dull your high gloss floor. Believe it or not but you can leave battery acid on the floor for as long as you like but brake and carb cleaners tend to be very nasty stuff and can cause dulling. 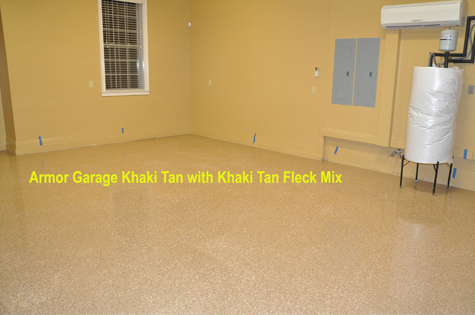 GARAGES: Home garages can use any of our floor epoxy coating systems. It depends on the look you like the most. If you have lots of grown up type toys you will be keeping in the garage, then we recommend you upgrade to the military grade topcoat if using Armor Chip or Armor Granite. If you have lots of toys and are doing a lot of work, go for the commercial epoxy system. If you must have the colored flake look then do the industrial system and add the color flakes into the epoxy layer. If you just tinker around in the garage, either Armor Chip or Armor Granite is perfect for you. Upgrading to the military grade topcoat is not a bad idea in these cases either. For commercial garages you can use the industrial system for high volumes garages or the commercial system for light to medium vehicle traffic. The issue with commercial garages is down time so more often than not you will need to use the Ultra Fast Epoxy Floor System. PRODUCTION FACILITIES: WAREHOUSES AND DISTRIBUTION FACILITIES: All need heavy duty epoxy floor coatings. The concerns are downtime and durability. High volume warehouse and distribution centers with lots of forklift and pallet jack traffic should grind the floor and apply the industrial three layer system. Low volume facilities can use the two layer commercial system. Same theory applies to production facilities, if you have lots of repetitive traffic such as product and material dollies that travel over the same path continuously then you need the three layer system. If you have light traffic, then use the commercial system. If your floor is use 24/7 then down time is a major concern and you�ll need to use the Ultra Fast system. It�s the only epoxy floor coating we know that has both the fast drying feature coupled with a super strong finish. There is no other coating that will give you725 psi adhesion and 3 mgs (the lower the number the better) abrasion loss protection. If you are a food production facility, then cleanliness is a major concern. We recommend that you install cove base if not already installed and you can run any of our epoxy floor systems across the floor and up the cove base to form a waterproof tub effect. This makes wash downs super easy with the worry of water getting anywhere you don�t want it to. Our flooring epoxy coating systems are USDA approved. Pharmaceutical facilities fall into the same category as above. In areas that have battery charging stations or use chemicals or acids for production we strongly recommend you use one of our Novolak epoxy floor systems. Novolak is a class of high tech epoxies that are designed specifically to resist acids and chemicals. Our Novolak epoxies are resistant to over 300 chemicals and acids. Breweries & Distilleries: We recommend the two layer commercial floor epoxy system for the majority of these installations. Unless you�re a major operation with high volume forklift, dolly and pallet jack traffic which would require the three layer industrial epoxy system or the Ultra Fast. The commercial epoxy system can handle all caustic and high temperature wash downs as well as the industrial coating can. The main difference is in the durability, the industrial system will last a lot longer in both the low traffic facilities as well as in the high traffic facilities. So there you have a lot of the most common flooring epoxy applications. But by no means anywhere close to all the applications epoxy floor coatings can be used for. If your application does not fit into any of the above scenarios give us a call to discuss and we are positive we can put together an epoxy flooring package to meet your needs. Below are some of the most frequent floor conditions we run into and our recommendations as to what extra steps if any are needed to epoxy coat your floor properly. The goal here is to make sure your floor doesn't end up looking like the blue arrow in this picture which was done with a hybrid epoxy without a true topcoat. There are links at the bottom of this page to all the products discussed below. Floors That Should Not be Epoxy Coated: There are certain floors that are better off with other types of floor covering. Floors without moisture barriers or high water tables where you have water coming up from beneath the slab should not be epoxied. The hydrostatic pressure and corrosive mixture of high moisture and lime in the concrete will cause any epoxy to fail. Floors with moisture barriers and low moisture levels can be moisture sealed and then epoxied. What is a low moisture level, sometimes a floor will get a slightly wet looking surface. If this happens on rare occasions you can moisture seal the floor without worrying about future issues. Moisture that gets onto the floor from above the slab will have no effect on the floor epoxy, in fact our epoxy kits will make the floor water proof. Garage floor tiles are a good solution for floors with serious moisture issues. They provide a new surface quickly, economically and without mold or mildew concerns. If your floor matches the description above please consult with us prior to applying any epoxy floor coating. Floors that are in a very badly deteriorated state with crumbling, flaking, exposed and corroded rebars or heaving concrete should not be coated. These types of floors should either have a new topping slab applied with a product such as Ardex-15 or have interlocking tiles or the rollout rubber mats applied over them. Interlocking Tiles and Rollout Mats are a great way to cover floor defects that would otherwise be extremely time consuming and expensive to fix. The tiles are strong enough to bridge large gaps and are flexible enough to conform to uneven contours in a floor. The rollout mats are also flexible and can span slightly less large gaps and cracks. The tiles are more durable since they are made from solid PVC up to 5/16" thick while the mats are made from Polyvinyl Rubber which is extremely durable but is only 1/8" thick and not as strong as PVC. In fact nothing is as strong for flooring as PVC. Polypropylene is often used in lower quality tiles due it being a much less expensive material to manufacture with. Caution should be used prior to purchasing polypropylene tiles or mats made from regular vinyl. Both of these materials are inferior to PVC and Polyvinyl and will not provide the same level of satisfaction and very often do not save you any significant money. New or Old Concrete Floors: You must wash off all surface dirt and residues, power wash for best results. Then etch the floor with our acid safe etching solution that is provided in our kits. Etching removes the deep dirt and opens up the concrete pores so that the epoxy has a rough surface to adhere to. We cannot emphasize this enough, it's crucial to get your floor 100% clean. Then let floor dry 24-48 hrs depending on ambient conditions and then coat with one of our Floor Epoxy kits. Note, etching does not remove grease and oil stains. You must use an oil/grease remover for this. It is important to remove all oil or grease stains as no epoxy can or will adhere to them properly. For stubborn oil stains use Liquid Tide scrubbed in with etch solution. For floors that are mostly oil stained use our oil stain primer first. New floors must cure for a minimum of 30 days before application of any epoxy coating. You must etch new floors in fact we recommend you do an extra strong etching or a second etching on new floors since they have lots of curing residues at the surface that need to be burned out. If using the instant crack repair compound you will patch any cracks or divots after the etching process. If using the standard crack compound you would do repairs prior to etching. The end result is you want a floor that is dry, rough to the touch, as clean as new concrete with no cracks or divots visible. This will ensure a proper bond and a beautiful final finish. FLOORS THAT ARE SEALED: All sealers MUST be removed entirely. First you should rent a floor grinder and grind the sealer off. You can rent floor grinders now from Home Depot for not a lot of money. As an alternate you can run a buffing machine or sander with a very aggressive grit over the floor to break the surface of the sealer as much as possible. Then use a strong Muriatic Acid solution of 2 parts water to 1 part acid to remove the sealer. Test by sprinkling water on the floor, if it beads up then resand, reetch and retest. 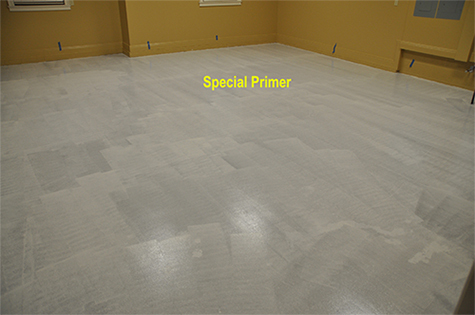 Neutralize floor with TSP powder after etching has fully removed the sealer. Depending on the grade of sealer used it may be necessary to diamond grind it off. Most sealers used are a retail grade type of sealer and a good acid wash will do the job. High quality industrial grade sealers will only come via grinding. In any case do not attempt to apply any epoxy paint over a floor that still has sealer on it, you will be wasting your time and money. Workshop Floors For light duty workshops or work shops that are part of large residential garages use Armor II listed below. You can also use the Armor Chip or Armor Granite kits for home workshops if you want the color flake look, but we would recommend that you upgrade to the Military Grade Topcoat which makes their finish as durable as the Armor II system. Colored flakes are not recommend for use with the Armor II system. By light duty we mean a low volume of vehicles per week(30-40) on the floor, low amount of steel wheeled traffic from floor jacks and tool chests and periodic forklift traffic. For medium to heavy duty workshops(50-100) use the Armor Ultra listed below. If you have a high volume auto repair shop with lots of steel wheeled traffic or you are operating a forklift on the floor on a full time daily basis then you need to use the Ultra System. Race Shops are recommended to use either the Armor II for smaller shops and the Ultra System for larger higher traffic shops. This is why we offer so many kits because there are so many variables that determine which is best for you. Machine Shops: Use similar guidance as workshops to choose the best epoxy kit for your floor. Remember it never hurts to over protect your floor. You can only get into trouble if you under protect your floor by using an epoxy not rated for the traffic loads you will be putting on it. So in general if you have a CNC type machine shop with light forklifts and light traffic volume then Armor II is fine. Again you can go with the Chip or Granite kits if you want the colored flake look but just upgrade to the Military Topcoat. If you have a heavy equipment machine shop with heavy Forklift loads being moved around constantly and lots of steel wheeled traffic then Ultra is a must. Pitted or Corroded Floors: The Armor Ultra, Armor Chip and Armor Granite Epoxy System use extra thick epoxy that allows you to fill in pitted and corroded areas. Filling in requires additional material so we recommend that you call us to discuss how much additional material you will need. The method of filling in pitted floor areas is fairly simple. You first do a coat of our high build epoxy with a flat squeegee, pulling the squeegee along the floor with enough downward pressure on the epoxy so that the epoxy fills in the pits and small divots but leaves very little material on the floor itself. Let that dry and then apply a second coat of high build epoxy to the entire floor to provide the smooth surface. This is why you need more material. For large, severely pitted or corroded areas we recommend grinding down those areas or resurfacing with our Crack & Joint Compound (available in the crack & joint repair section) to reduce the amount of extra epoxy needed. Oil Stain Floors: Floors that are heavily stained with oil such as service shops or older floors that had leaking oil drip on them for years are very difficult to clean and most likely will need our Oil Stop Primer. For lightly stained floors you can use an oil & grease remover, for large heavily stained areas you must coat these areas with our oil stop primer. This primer is specially made to adhere to oil. It's available in each of our epoxy kit sections. We recommend that you remove as much of the oil as possible with an oil remover then acid etch the floor and let dry then apply the oil primer to the stained areas. For small heavily stained spots you can use Tide Detergent to effectively remove those stains. If a majority of the floor is stained it is recommended that you oil prime the entire floor. Let primer dry overnight and then apply any of our epoxy kits. 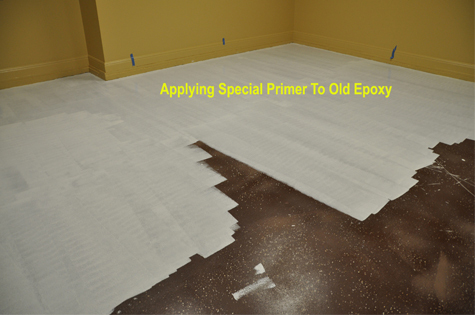 Note: if using a light color epoxy such as Beige or white it is recommended that you epoxy prime the entire floor to maintain an even color finish since the oil primer is black in color. Floors That Need To Be Done In One Day! For this you'll need to use either the Armor Mats or Armor Tiles. Both of these flooring products can be installed in a matter of hours. If you want to epoxy your floor and be back in service the same day you'll need to use our fast dry-one day epoxy kit. You'll have to diamond grind the floor so that you can apply the epoxy immediately when done. This is a complete two step kit and drys extremely quick so that you can start in the morning and be using the floor at the end of the day. Basement Floors. These are the toughest floors to coat properly due to cracks, being covered with mastic or having water coming up from underneath. Moisture coming up form underneath is the worst problem since the rising water acts like a hydraulic jack and will push off any coating on the floor. Before coating any basement floors, do a moisture test by taping a 4x4 piece of plastic on all four sides, wait 48 hrs, if moisture is present under the plastic you must use our wet basement floor kit. If no moisture is present use our dry basement floor kit. For VCT, Ceramic, Porcelain, Terracotta Tile Floors. Our kits work great over any type of VCT Tile! Secure any loose or broken tiles, fill in any missing ones with cement patch or other cheap VCT Tiles. Sand down tiles lightly to roughen up and to make sure any factory coating is removed. If your tiles contain Asbestos, DO NOT sand as this will release Asbestos particles into the air. You can use chemical cleaners to strip the tiles clean and then rinse well. You can clean and etch the tiles with our Acid Etching Kit. Then coat with our Coat-All Epoxy Kit. Your old VCT Tiles will now be Permanently encapsulated! This kit is also good for coating over ceramic tiles, glass tiles, porcelain tiles or terracotta tiles. Wood Floors. Wood floors can be coated with our epoxy kits. Simply sand the floors to remove any dirt and factory coating then prime with our Special Primer and coat with the epoxy kit of your choice. We recommend you call us for wood floor applications to review details just to be safe. Cracks, Expansion Joints and Uneven Slabs. We have a whole section for these issues and we have a product for each condition. Hairline surface cracks will be filled by our epoxies. Larger cracks must be repaired with our crack and joint kits. In most cases the Instant Crack Repair kit will do the job. You simply mix Part A and Part B together and putty knife into the crack scrape smooth and then in 15 minutes you can epoxy right over the repair. No waiting 24 hrs for the compound to cure. Expansion joints and saw cuts can be filled or can be left as is. Keep in mind that these features have been put in your floor for a reason. On new floors we strongly recommend that you do not fill them in with a compound that hardens. Your new floor has not settled yet and will crack right in the middle of your new epoxy job if you fill in the Saw Cuts. Trust us you will not be happy if that happens! You should simply finish the Saw Cuts with the epoxy and having them look like Stone Slab Joints. Epoxy finished saw cuts add dimension to the floor and enhance the final appearance by looking like actual stone slab joints. There is a difference between an Expansion Joint and a Saw Cut or Control Joint. An Expansion Joint is one that has a material in the joint. We recommend that expansion joints not be filled in and simply coated over. If you want to fill in the Expansion Joint then you must use our Flexible Joint Sealer which you can purchase from the Crack & Joint Repair Product page. This will bond with our epoxies and still remain flexible enough to handle your floor's expansion and contraction. Saw cuts can be filled with either the Instant Crack Kit or the Crack & Joint compound which you mix with locally bought Play Ground sand to form a mortar that you apply to large cracks and divots. Let it cure over night and then you can sand or grind smooth if needed prior to applying our epoxy. After filling cracks or expansion joints, etch the floor and repaired areas then coat unless you are using the Instant Repair Compound then you etch first then apply the Instant Crack Repair Compound. See the Crack & Joint Repair section.